Slice the eggplant and sprinkle with salt on each side. Set aside on large baking sheet for thirty minutes, rinse and pat dry. This removes the bitterness from the eggplant. Preheat your oven to 425 degrees. Brush or rub each side of the eggplant slices with olive oil. Sprinkle both sides 1/2 tsp each sea salt and fresh ground black pepper. Place eggplants slices on a cooling rack that’s on a baking sheet, and bake until they are softened and a little brown, approximately six minutes. Remove from oven. 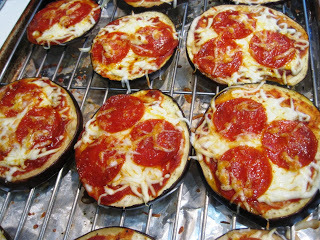 Spoon the marinara sauce on the eggplant slices, add the cheese and nitrate free pepperoni. Go crazy with adding your favorite toppings! Return the baking sheet to the oven and bake for another five minutes, until the cheese is melted. For an extra crisp topping, broil for a few minutes until browned. Enjoy!